#BRAOU ET Results: BRAOU Eligibility Test Results 2019/ Ambedkar University #Degree #Entrance 2019 Results/ BRAOU Degree Eligibility test results 2019/ Ambedkar Open Degree entrance results 2019/ Dr. B.R. Ambedkar Open University Degree Eligibility Test Results 2019: Dr. B.R. Ambedkar Open University issued the Under Graduation Eligibility Test 2019 Notification in December/ May. This Eligibility Test Notification for Admission into B.A./B.Com. /B.Sc Programme into their study centres for the academic year 2019-2019 in AP and Telangana States. The BRAOU invited the online applications from the students, who want to seek admission into distance degree courses and Applied candidates were appeared the eligibility test, which was conducted on 22-07-2019 by 10.00 AM to 12.30 PM at all the regional coordination centers and it was conducted in English, Telugu and Urdu media at their centers. Eligibility test qualified candidates can take admission at any center his / her choice. The candidates who were appeared for this test stream, they are waiting for their results. Second Eligibility Test Results 2019 will be released by the University Officials. Appeared candidates can check their results in the following link. 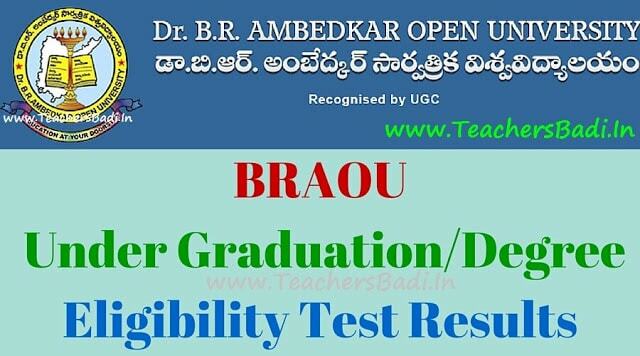 Dr B R Ambedkar Open University (BRAOU) is going to announce the results of the Degree Eligibility Test (ET) conducted in March/July throughout the States of Telangana and Andhra Pradesh. The Eligibility Test results would be available on the University website: www.braou.ac.in. Candidates can download their ‘marks memo’ from the University portal www.braouonline.in. Successful candidates will be given admission into undergraduate programmes for the academic year 2017-2019, leading to B A/B Com and B Sc degrees. Last date for admission into degree courses is to be declared soon on website.